Matter is the stuff all around us. Matter takes up space and has weight and mass. Mass is the amount of matter there is. It is often measured in grams. Matter has properties. Properties are things you can notice or observe about something. Some properties are size, color, smell, texture, and shape. Solids have a fixed shape. They don’t change shape if you put them in different containers. Examples of a solid are a desk, a brick, paper, or coal. Water that is in a solid state is ice. Liquid has no fixed shape. Liquids do have a fixed volume or amount of space they take up. If you have one cup of milk, it is the same amount of milk whether it is in a small cup or a large bucket. Liquids change shape depending on what container they are in. Examples of liquids are milk, juice, and gasoline. When water comes out of the faucet, it is in the liquid state. A gas has no fixed shape or volume. A gas can shrink or grow to fill whatever container it is in. Examples of gas are the air we breathe, helium, and smoke. Water changes into steam when it is heated. Steam is a gas. All three states of matter have weight. Even a gas has some weight. 1. What is an example of something that is not matter? 2. What are the three states of matter? 3. Which of these is not a property? 4. Which of these is a solid? 5. Which of these is a gas? 6. Which of these is a liquid? 7. What state of matter has no fixed shape? 8. What state of matter has no fixed volume? 9. Name three solids, three liquids, and three gases. 10. What are three properties of your desk? 11. Draw a picture that shows water in three different states. One important thing about a mixture is that it can be separated back into its separate parts. Sometimes this is easy. 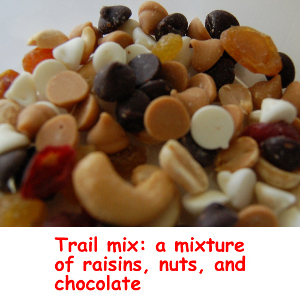 For example, you can sort trail mix into peanuts, raisins, and chocolate candy. Special tools can be used to separate mixtures. A screen with holes in it can be used. If you use a screen to separate gravel, the small dust and pebbles will fall through. The larger pieces of rock will not fall through. Another tool is a filter. Filter paper has very small holes in it that you can’t even see. Liquid will go through filter paper, but small solid pieces will not go through. Sometimes separating a mixture is harder. To get the salt out of sea water, you have to evaporate it. If you leave a bowl of ocean water out until all the water dries up, you will have just the salt left. 12. Which of these is not an example of a mixture? 13. Mixtures can always be separated into their parts. 14. Which of these is a tool you can use to separate a mixture? 15. How could you separate the dirt out of dirty snow? 16. What tool could you use to separate a mixture of salt and iron? 17. 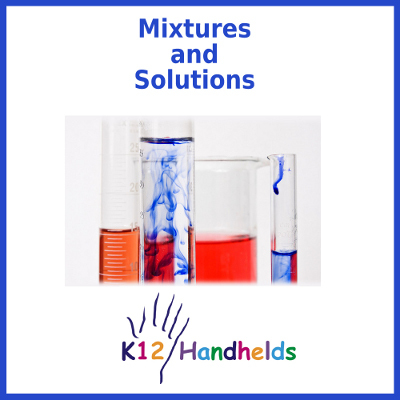 What is an example of a tool you might use in your kitchen to separate mixtures? One special kind of mixture is a solution. A solution is when things are mixed together completely evenly. You can’t see or tell the difference between one part and another. Scientists call this a homogeneous mixture. That means that they are the same throughout. There are no large pieces of one of the parts. Solutions cannot be separated by a screen or a filter. That is because the parts are mixed together in a way that they all have the same size. 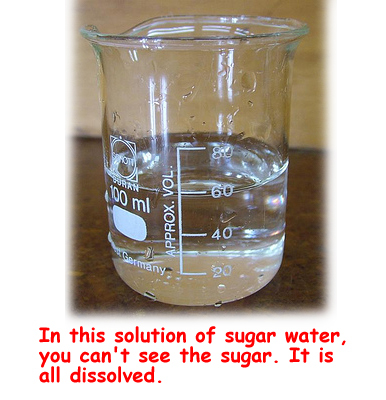 One example of a solution is when a solid is dissolved into a liquid. When something dissolves, it spreads evenly throughout and seems to disappear. When you stir sugar into water and it seems to disappear, it has dissolved. You can’t see the salt in ocean water because it is dissolved. As we saw above, a solution can be separated into its parts just like other mixtures. This happens through evaporation. When something evaporates, the liquid part changes to a gas and goes away, leaving just the solid behind. If you leave a pan of sugar water out in the sun, the water will evaporate, leaving behind just the solid sugar. Some solids, like salt and sugar, form crystals. Crystals are a kind of solid that are clear and are organized in repeating patterns. 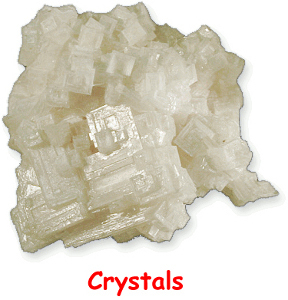 Examples of crystals are diamonds, quartz, salt, and sugar. Whenever you separate a mixture or a solution, there will always be the same amount of each part as there was before they were mixed. This is called conservation of matter. Imagine that you mix 2 grams of sugar into 1 liter of water. If you evaporate the water, there will be 2 grams of sugar left. There will also be 1 liter of water, but it will be in the air in the form of a gas. 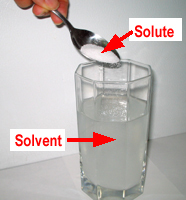 In this kind of solution, the liquid is called the solvent. The solid, like the salt or sugar, is called the solute. Not everything can make a solution. If you stir sugar into water, it will dissolve. However, if you stir sand into water, it will not dissolve. No matter how much you stir you will still be able to see the sand in the water. It is a mixture but not a solution. Solubility is the property of something dissolving. Sand is not soluble in water. Sugar is soluble. There is only so much solute that will dissolve in a solvent. For example, mix one spoon of sugar into a glass of water. 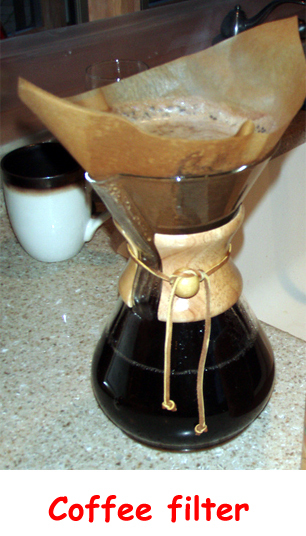 Stir it, and the sugar will seem to disappear. It will dissolve. Then add another spoonful, and stir. Keep adding spoonfuls of sugar. At some point, no more sugar will dissolve into the water. That is because the solution is saturated. That means no more solute will dissolve into it. Concentration is the amount of material that is dissolved. If you put one teaspoon of salt in a glass of water, it has a low concentration. If you put 10 teaspoons of salt in the same glass of water, it has a high concentration. This is because it has a lot more salt dissolved in the water. If you take the glass of water with 10 teaspoons of salt in it and add it to a bucket, you can add more water. If you add 20 more glasses of plain water, the concentration will be lower. There will be less salt per glass of water. Adding more solvent (water) to the solution is called diluting it. 18. Is oil and water a solution? 19. Is snack mix a solution? 20. Is soda pop a solution? 21. Is air a solution? 22. In ocean water, what is the solute? 23. In ocean water, what is the solvent? 24. How can you separate a solution of sugar water? 25. When a solution is ___, no more will dissolve. 26. If you taste a glass of lemonade and it is not sweet enough, what would you add? 27. If you taste a glass of lemonade and it is too strong, what would you do? 28. Describe making a pitcher of fruit punch from a dry powder mix. What is the solute? What is the solvent? What is the concentration? How do you know if it is saturated? 29. Why is frozen orange juice called “concentrated”? 30. Can thing be dissolved in water? Why or why not? 31. How would you do an experiment to find out if water temperature affected the solubility of salt? Describe the steps. Part 1 - Match each word to its definition. Part 2 - Match each word to its definition. Part 3 - Match each word to its definition.